Every gunsmith knows no two screw slots are ever exactly the same. Because so many factories use outside vendors for screws, slot sizes can vary, even within the same model of gun. If you want to be professional about your work, you custom grind each bit to the correct size, a frustrating and time-consuming task without a Super Set. The Super Set comes in graduated 22-bit, 44-bit, and 58-bit configurations, so you’ll always have a screwdriver blade that precisely fits the size and width of virtually any screw slot. You get flat blades in 9 different widths from .120" to .360", each with four to six blade thicknesses from .030" through .070" in .005"or .010" increments. Each 1½" long bit is marked with its blade width and relative thickness number, 3 for thinnest, 4 for next thicker, etc. The 22 Bit Starter Super Set eases you into the powerful Super-Set concept with the 22 straight bits (#120-3, #120-5, #150-4, #150-6, #180-3, #180-5, #210-4, #210-6, #240-3, #240-5, #240-7, #270-4, #270-6, #300-3, #300-5, #300-7, #340-4, #340-6, #340-8 ,#360-3, #360-5, #360-7), your choice of one handle, and the heavy duty box, and tray. When you’re ready to expand your set, the Super Set Add-On Pak lets you upgrade it to the same configuration as the 44-bit Super Set.The 44 Bit Super Set Plus has all 44 slotted screws below (#120-3, #120-4, #120-5, #120-6, #150-3, #150-4, #150-5, #150-6, #180-3, #180-4, #180-5, #180-6, #210-3, #210-4, #210-5, #210-6, #210-7, #240-3, #240-4, #240-5, #240-6, #240-7, #270-3, #270-4, #270-5, #270-6, #270-7, #300-3, #300-4, #300-5, #300-6, #300-7, #340-3, #340-4, #340-5, #340-6, #340-7, #340-8, #360-3, #360-4, #360-5, #360-6, #360-7, #360-8), one handle of your choice, a Stubby Handle (just the ticket for working in tight places), and the heavy duty box and tray.The 58 Bit Master Super Set Plus adds 10 hex-head bits (#185-9, #185-10, #185-00, #185-0, #185-1, #185-2, #185-3, #185-4, #185-5, #185-6), 3 Phillips-head bits (#440-1, #440-2, #440-0), and a 1/8" square bit for Remington buttplates to the contents of the 44 Bit Super Set Plus. It's the most incredible screwdriver system you will ever use! SPECS: Bits: Slotted- 1½" (3.8cm) long. Allen (Hex) Bits - 1" (2.5cm) or 1¼" (3.17cm) long. Phillips Bits - 1" (2.5cm) long. Handle: 1" (2.5cm) diameter, 8" (20.3cm) long. These are the standard screw slot blades for gunsmith. Amateur hobby gunsmiths should definitely have full set of these. Professionals can quickly "grind-blade-to-fit" but hobby guys or when we get lazy, will use a driver blade that "sort of fits"; it's human nature. If you use "sort-of-fits" you will ruin gun screw heads,( amateurs may ruin screws anyway due to bad technique). Without Brownells MagnaBits, you're doing A LOT of grinding/fitting/heatreating driver blades to screw slots. With MagnaBit full set at the bench, you will use correct driver size; because so many sizes are conveniently at your finger tips. It's human nature. Because these bits are steel (without the cushion of a plastic handle attached) they can be used alone to hammer-impact a screw to help break the set. Which of these 58 bits do I use? Which one is correct for this 1911 grip screw..? Have confidence in yourself, you'll quickly choose the correct bit because they're organized so well and visually you'll soon be thinkingâ¦width and thicknessâ¦ You'll be choosing the correct bit within seconds. The heat treatment of these bits is excellent. There's handles all over the place that fit these. Pick a handle with good size grip (for torque control) and short shank (for slip control and tip alignment feel ). Why is a professional gunsmith taking valuable time to write this review? Because I get sick of ruined gun screws. If you have a tough gun screw challenge, don't keep going and ruin the gun, take it in, gunsmiths are very good at gun screw work. Remember, gun screws aren't like lawnmower bolts. Most all gun screws are made exactly for THAT gun and location. 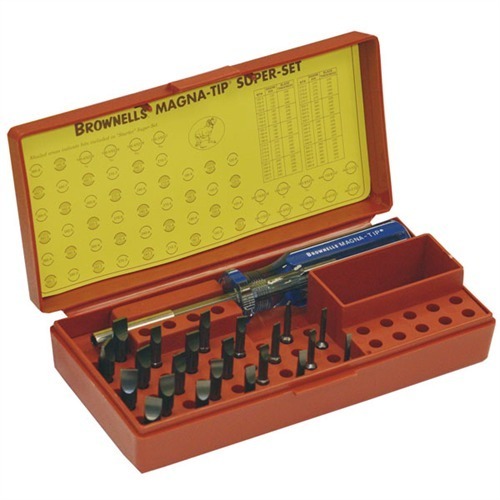 Finding a correct new screw or having a gunsmith make and heat treat a replacement, will pay for the cost of Brownells MagnaBit set. Have a nice day. Roger Williams, Gunsmith A.A.S., Northern Magnetic LLC, Fredonia, WI. This is a high quality,versatile set and a must for the professional. Brownells service and guarantee can not be beat. I broke a bit on a very stubborn screw and it was replaced with one phone call, try to do that with the others! I don't know how I've gone so long without a set of gunsmithing drivers. I'm not a gunsmith, just a user, but I really do consider a set like this to be mandatory for every gun owner that's interested in keeping his/her firearms clean, oiled and in good working order. I got the kit earlier today, and it had bits to fit my Uberti conversion, my Marlin 1895, etc. Just a great product. Well made and sturdy as well. Again, you need a driver set that's fit-for-purpose and this one will serve you very well. The _only_ complaint I might make is that the case could be wooden. The plastic one could have been improved upon, but the tools are great. bits only for Ruger screwdriver set. Putting on both son's Christmas list. I had wanted this set for years but made do with "common" fixed bit "gunsmith" screwdriver sets from the gun stores. Finally ordered this set and it is a pleasure to use. I had read Kinks and ground some blades to fit a few times but after using this set for just one weekend I know what proper fit finally is. Worth every penny! Thin bit set is on my wish list now. I bought this set plus the thin bit set, both sets are high quality. When I first started as the Small Arms Repairer for the Utah Army National Guard in 2002. My boss who was a gunsmith on private side told me this is the first thing I should get. As with everything he has advised me on he was right. I am glad I got this set. It has lasted in my shop for over 12 years with lots of other soldiers using it without breaking a single bit. I have tested some other sets from other companies and they do not have near the strength. I have used this set more than any tool in my shop. I am hoping to upgrade to the Professional Super Set w/ Adjustable Torque Handle as soon as I get the money. Like I said these Magna Tip sets are the best. Thanks. My detailed review keeps getting blocked so I will keep it super simple, watch the bit thickness because some of them are half way between sizes or a full size off. I was pretty disappointed when I tried to use this new set and found out that there were no bits that fit my Browning A5? Thought if I purchased the largest set that it would cover just about every gun, but it does not. Worked great on my Ruger 10/22. Well, I guess that I have read enough horror stories about messing up perfectly good screws on firearms, so I spent the money and bought this kit. And I have to say that it is well worth it. Everything was there, no bits were missing, duplicated, ect. If you are going to be doing any work on your firearms do yourself a favor and use the correct tools. If you are like me you would just be kicking yourself in the rear if you mess up a perfectly good firearm when you knew that the correct tools would have prevented that from happening. Well worth the money, it is a complete kit. The quality of the set is excellent. Mine came with 2 180-4 and no 180-6. I emailed brownings about it and a 180-6 shipped the next day. I had the same problem as another reviewer, having a duplicate bit. Brownell's rectified that right quick. The quality of this set could not be higher. It is really top shelf gear. I have used it a number of times and I wish I had ordered it years ago. Now it irks me when someone pulls out a leatherman tool and expects to effect a quick repair or adjustment in the field. Not on my guns! Best bit set I have ever owned. Very good quality. Enough bits to fit every need I can think of. Great customer service too. In the past 20 years I have used this set on everything that I care about (guns, cameras, RC cars, boats & planes etc.). In all that time I have never broken or bent any of the bits in this set. That alone, I think is quite a testament to the quality of this set. I have owned other taper curved bit screwdriver sets and this is the only one that I can say that about. I have also, always been able to find the bit that I needed and through the years I have added some of Brownell's, allen, square, phillips bits and a few bit holder short shank screwdrivers. Even if I ever did break a bit, it is easily replaceable at Brownell's, what else can I say. The right tool for the job.....! No more messing up screws. This set has almost everything you need. The hex allen bits are a bit short but that's okay. It is really nice to have what you need at your fingertips. If you are like me and money is tight, this is a great value. This kit comes in very handy. As most gunsmiths know, you're always grinding a screw driver that will fit. I still do, but not as much as before I purchased this set. I'm glad that I purchased this kit. Very handy shop tool !! Do not spoil your arms screws head by using any diffrent size of screw driver head , Go buy it off this is the great thing to have...one must have in the accessories rack. I wish I would have been smart and bought this great set a long time ago. Not wanting to spend the money for a high quality set such as this, in years past I've purchased kits costing less and have been been duly disappointed. Cheaper kits, while costing less, will leave you with bits that break, bend, and don't even fit your gun's screws well from day one. While it is unwise to pay too much for an item, it is also often incrediblty stupid to pay too little, because too often the item you bought is incapable of performing its intended task. This 58 bit Super Set is well named. It is SUPER! This kit has enough of the right items to allow use as both a bench and field kit for a huge variety of arms. Everything about this kit says quality, American quality, and that means a lot to me, and you cannot beat Brownell's unconditional lifetime guarantee should anything break. The storage case is also a nice item. It's heavy duty, keeps everything in it's place, and the bottom tray comes out for benchtop use. The bit locator diagram in the lid is also a nice touch. The folks at Brownells knew what they were doing when they put this set together. Although this would make a great bench set, I use it in my field repair kit. I love it. It meets my admittedly-high expectations each and every time. I'm no longer concerned about whether or not my set will do its job right the first time. I know it will. If, like me, you are tired of getting "bit" by inferior quality bits, do yourself a huge favor and step up to the big league with this wonderful set. You'll be glad you did. If you work on guns, it is a must. You simply choose your bit (width and thickness), insert it in the handle of your choice and get on with doing a proper job without any risk of damaging your work. Bits are laid out in a neat array making it very easy to choose the correct size without guessing. This is exactly how screwdrivers should work. Just about every tip in the box is used. It could be improved only if it included the torx tips in the set. I'm very happy with the product. As the primary range master and armorer for a police dept in Southern California, I have used various seperate tools to work on different types of firearms. I have found none nore useful than the Magna-Tip line of screwdrivers. Any of the Magna-Tip sets are well worth the money. I have used my personal set for almost 20 years. The range of bit sizes of the larger sets ensure a perfect non-marring fit. The quality is fantastic. The only negative point is the tips fit a little loose in the handle. If Brownells tighten up the dimentional tolerances of the bit in the handle, this would make a great product perfect. Great starter set tho expensive. Missing a blade thin enough to remove the screws protecting the threads in the base mounting are of a Browning Short trac. Also, no torx bits at all in this set. A bit expensive, but you get what you pay for. The Magna-Tip driver has been a standard tool in my shop for more years than I can remember. I used it to replace about a hundred or so separate, regular drivers; each one hand-ground specially for every size screw slot I had run into up to then. I had so many drivers they took up two large drawers and I can still remember going crazy trying to find just the right one about 5 times a day! The magna-tips ended all that and they save loads of time each day, I love em'. I've reviewed and recommended the Brownell's Magna-Tip screw drivers in books and magazines for many years. No they won't do every job perfectly but I have found they will do 98% or more of the job's at least very well. There are still some screw slots where it is always best to grind a special blade or magna-tip to fit perfectly but they are a small percentage of the work we do. The smaller, thinner blades are prone to breakage but to be fair, so are the smaller, thinner conventional hollow-ground screwdrivers. I have heard several complaints from guys who have broken a bit and slipped, scarring the gun badly and then they blame it on the screwdriver. Maybe there is merit in the claims, I doubt it though. In all honesty, the only time that exact thing has ever happened to me was when I failed to follow my own shop procedures and tried to rush or was distracted and didn't pay the normal close attention to what I was doing. In my experience, if the person handling the screwdriver exercises care and thoughtfulness, following well documented procedures for removing stuck screws, then he/she should not have any problems with Magna-Tip bits, or any other screwdriver for that matter. Frankly, we don't break many driver bits in our shop, perhaps we crack or break one a month but who care's? Brownell's stands behind them so if one breaks they replace it. All around, this is a great product, a staple part of our tool kit and I highly recommend them to any gunsmith or hobbiest. I first learned about the Magna Tip bit system from a dear friend. I dreamed about a this extensive set for years to come; I tried all different type, brand, and/or styles of screw drivers none worked as well or fit the set head like the Magna Tips do. Long story short, I spend more time trying to find a substitute for the Magna Tip than I did finally buying the set. I've had this set for general use and smith work for 30 years. From time to time I add a piece or 2. The case it's in is highly durable, long lasting (30 years), and very, very convenient with slots for many inserts. This is a must for a serious user. My wife bought this set for my birthday and I do not know how I got along without it for so long. I am a certified Gunsmith and this set fits everything I have worked on! It is well worth the cost. This is the only set you will ever need, I retired my old set for garage use. I guess the previous reviews say it all, and I can only agree: If you're serious about gunsmithing, you need to get this set. Someone said that it doesn't have bits thin enough for a certain application and I'm sure that's true. Still, I doubt that there is any set that will include bits for every gun screw ever made and the thinner bits are available as a separate set (#080-120-000) for those who need them. The only negative thing about this set is that the box could have been a bit better, real hinges that make the lid stay open would have been much better. This is a minor inconvenience though, I'd still give it a solid five stars. Well made, the bits stand up to use with an impact driver on the screws that are really, really stuck. They could fit a little more snugly in the handles though. If i did it again I think I'd get the LE handle. The thickest two flat blades in the narrowest three widths I haven't found a use for, so I ground them down to fit the really thin slots. Would be better if Brownells hadn't decided to put thicker bits in the super set and sell the thin bit set separately, but instead left the super set with the thin bits and sold the thick ones in the Super Set Update kit (which I rarely if ever used) as the add on set. Other than these two minor drawbacks I really like them. Once you grind or buy the thin bits, you'll hardly ever have to grind a screwdriver for the job. And if you have limited bench or tool box space, like I did while I was in school, these really help free up room. Great set. Has a size for most needs. I wish it had a few really small sizes. I had to adjust sights on a ruger 10/22, and it didn't have a size that small. I use this set very often and I am very pleased with the product. I've had it for about 2 years. Holding up well. It was missing one size when initially sent. If you do just a little gunsmithing or detail clean your guns, get this set. You won't regret it. This is a great set to start off with if you work on your own guns or you're a professional gunsmith. I've had mine for years and over those years have probably aquired every related bit and attachment you can get for the Brownells' Magna set. I've never had a stripped screw slot since using these bits and the nice thing is when the bit wears out, you just buy that part only. Truly pays for itself over the years and gives piece of mind knowing when you torque on a screw, the head won't strip out on you. Simply the best. I first bought this set of tools back in the mid "90's" while in gunsmithing school. I can not tell you the number of customers I have gained by not messing up the screws on their firearms or, removing and replacing screws that were "Buggered UP" from having the wrong screwdriver used on them! If you are a gunsmith and have been at the trade for a few years you know exactly what I am talking about! When I go to the range on "Range Days" this set goes in my tool box. I've had people bring me their guns at the range when they saw I had the right tools for the job! So this set has more than paid for itself. One of these days, I am going to have to get the coffee can out and start saving for the newest Brownells screwdriver set that runs for several hundred dollars. But if I ever do, I will still keep my 58 bit Master Set in my range box. With very few exceptions, I would say that this set covers 90 to 95%+ of my screwdriver tip needs. There is even space under that bit insert for extra bits which I use to carry some of my speciality "Thin" bits or torx head bits, ect. I've also used this set of tips on projects outside of the gunsmithing arena too. One you get used to not tearing up any screws you kind of get a bit spoiled about having the right tip for the job! If you starting out working on guns, or don't have the money, or need, for a larger bench set, I recommend starting with this set. Even if you add other bits as time passes, or eventually get the "Pro Super" set, you will still keep this set, and use it. In fact, you will be able to pass these tool bits and handles on to the next generation, should you desire. Hope this helps your decisions. Received my 58 bit set and it is perfect for my needs working on 20th century military arms. There was one bit missing from the 58 and a duplicate of another. I wrote a quick email to Brownells and BOOM! It was sent priority mail the same day. This is why I keep coming back. Quality products and quality service. I purchased this set to maintain my firearms without damaging the screws. It works exactly as advertised. Bits to fit S&W, Beretta, Browning, etc. Using the right tool for the job make the work go much easier. If you maintain or repair firearms this is a great asset to save you time, money, and embarrassment. Get the right tool for the job. As a side note I noticed that some screws even from the same batch may have different slot sizes. Take the time to do it right. You investments will thank you. This is one great product. I use it various weapons my son and I own, and it has a bit for about anything, and that includes for use around the house. The only problem I had, was when I received the kit, one of the bits was not in the set, and I had 2 of another bit. I contacted Brownells right away, they sent an email showing they had shipped a replacement bit, and it should be here in a couple of days. You can't ask for any better service than that. Believe me folks, the 58 piece kit is well worth it, and it's made in the good old USA, and if you're like me, I'll pay a little more for a good old American made product. After years of grinding bits to fit, I finally bought this set, and it certainly vastly exceeds the quality and selection of other brands I've used (or destroyed while TRYING to use them). I'm mildly disappointed, though, that this 'master' set has only one out of four of the driver heads necessary for working on that obscure revolver brand from Springfield, Massachusetts that's named after two old dead white guys. I'd gladly trade a few of the great honking bits for a couple more of the smaller ones. This is a MUST HAVE ITEM if you own & use your guns. Bits fit screws exactly & if you do your part WILL NOT mess up any screw heads! All is positive with this set and I can't think of anything negative about it! The 58 bit set has just about every bit that I'll ever need for the bit of gunsmithing that I do. I've had this set for over 25 years(mail-ordered, there was no internet then ) and it has proven itself invaluable! Any time I need a screwdriver for anything, gun related or not, I reach for this set! I intend to add some Torx bits soon, since they weren't in common use when I bought this set, and maybe a ratchet handle to upgrade a little, otherwise this set is the absolutely perfect! I have recommended this set time and again to people who ask about screwdrivers. I have broken a few bits here and there, but replacing bits is easier and less expensive than buying new drivers, so I can't really consider that a bad point. Bought screw drivers from an "Engineering" firm, broke as fast as I could use them.First one I used, snapped and gouged my BRAND NEW Marlin '94!! Purchased this set from Brownells and am happy as a clam. This is the second set I bought, one for the work station, now one for the camper. Shoot cowboy action, and "Smoke" Powder, need to clean guns in the evening. Have never had one fail me, and they have a life time warranty, which is a whole lot longer than the other brand. With they're help, wife and I have brought home a number of State and Regional championships. ( Mostly she has). Picked up this set while I was attending gunsmithing school at RCC in '94-'95. This set is going strong and is well used. Plastic box to my surprise is steal in one piece with the lid attached. If your just starting out, invest in quality products. Screwdrivers, roll and pin punches should be at the top of your list. I went with this product due to the large assortment and I couldn't afford the same amount of fixed blade screwdrivers at the time. Im glad I made the purchase, as this set is always with me in my kit while hunting or target shooting. This set keeps you from chewing up screw heads with standard screwdrivers - and most of the time keeps you from having to custom grind screwdriver blades to fit specific screws. I've used this set for many years, over which time I've also used similar sets from other manufacturers. You can pay less money, but you will not get the same quality of grind on the bits that you get with the Brownells set. I purchased this tool set to service my S&W revolvers. It is very well suited to the task. If used correctly you can avoid damage to screw heads. The selection helps you avoid having to grind bits for a good fit. The overall quality is very good and I think it's well worth the price. I have been an idiot for 44 year trying to fix and restore guns with out a proper screw driver set. one problem with this set is that you must spring for the thin bit set also. If you do any type of work on your own firearms these are well worth the price. Used correctly there will be no more marred/damaged screw heads. There is a bit for just about any size screw you are likely to run in to. Great investment, top quality !! I have had this set for over ten years. I can't count the number of times that I have used it for more than working on guns. It seems like every time my bride comes up with a honeydo list I end up grabbing this set over standard screwdrivers. With the kit you always have the right tool for the job. I would be nice if it did have torque bits though. Used Brownells products as a professional gunsmith for over 30 years. Can't beat em'!! I know I could have spent a lot less but lets face it, this set is awesome. I am already expanding it with the bit set to bring it up to the next level.